This is a 0.1nm resolution, compact spectrophotometer that uses the windows-compatible FL WinLab™ software that can measure fluorescence, phosphorescence and bio- and chemi-luminescence using a pulsed Xenon lamp source. Instrumentation The LS55 Perkin Elmer Fluorescence Spectrometer, 230V uses a pusled Xenon source to measure fluorescence, phosphorescence, chemi- and bio- luminescence. The FL WinLab™ software has different modes operation like Scan, TimeDrive, and Ratio Data Collection, increasing the versatility of the instrument. The excitation and emission monochromators can be used independently or simultaneously. 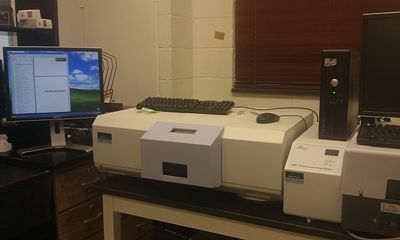 The instrument also has the ability to prescan the sample to determine the excitation peak and maximum emission. Included with the LS55 Perkin Elmer Fluorescence Spectrometer, 230V is a single-cell sample holder that can hold up to a 1cm pathlength cell and has the option of stirring. The automated polarizer has two filter wheels that have both a horizontal and vertical polarizing element. The polarizer is controlled by the software. access to the laboratory is restricted; see Dr. Miller, Dr. Hartings or Dr. Fox for access. There is a on/off switch located on the left-hand side of the instrument's panel. When the switch is turned on, the neon lamp on the front lower left-hand side of the instrument is lit. It takes about 1 minutes to initialize. The instrument should be completely switched on before switching on the computer. When Windows has completely loaded, start the FL WinLab software. After instruments calibrated and self checked, proceed to toolbar to select methods. Samples can be placed into the sample compartment. The door to sample compartment should be closed before samples are run. This cell holder requires no alignment or set up. It holds 12.5mm square (10 mm pathlength) cuvettes and can be thermostatted using circulated water. The stirrer status can be set to low, high, or off by clicking the accessory icon. The temperature sensor located in the block of the cellholder will report the temperature of the sample. After the sensor is calibrated using the FL WinLab LS55 Status application, the application will automatically record the temperature at the start of data collection in the result dataset header. Using the Read application, the intensity, polarization, or anisotropy data can be collected simultaneously with the temperature and saved as a spreadsheet. The event marker button on the front plate accessory can be used for identification of times when reagents are added to the cuvette. The equipment must be grounded. There are three Caution labels on the instrument, indicating that the user's manual needs to be consulted. In the sample area, the caution label warns users of the potential for eye damage caused by staring into the beam in the sample compartment. Near the mains inlet fuse, the caution label warns users that the operator replaceable fuse is a CSA approved fuse, not an IEC fuse. At the front left of the instrument, by the hand screw that fixes the top cover, the caution label warns that removing the cover can expose hazardous voltages. The caution label is coupled with a high voltage label. The other High voltage label is located inside the instrument on top of the monochromator cover. A single position water thermostattable holder for 10mm cuvettes. Dimensions (W×D×H): approximately, 2.5' X 2' X 8"
Add any other categories that may be relevant to your page. We use categories like tags. This page was last edited on 7 December 2012, at 12:00.